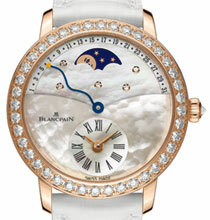 Faithful to its values of tradition and innovation, Blancpain now unveils the newest addition to the Women family of watches. Developed in a resolutely romantic and contemporary spirit, the Retrograde Calendar is a perfect expression of refinement and watchmaking know-how. Attention to detail shines through in this elegant timepiece, where technique is placed at the service of beauty. Aesthetically innovative, the new Retrograde Calendar delights with its surprising dial, featuring mother-of-pearl marquetry and extraordinary detailing. Hour and minute counters are decentralised at 6 o’clock. The calendar is indicated by a retrograde hand, which consistently jumps back to the first day of the month. The ensemble of technical functions are driven by an automatic movement; rendering the timepiece a fine companion for active, modern women. 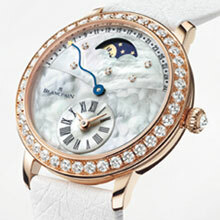 A dreamlike quality is introduced by the moon phase at 12 o’clock, which nestles in a starry, diamond-studded sky. Echoing the whimsical mood, the serpentine blue hand is tipped with a star, ensuring clear visibility of the date, displayed in the upper section of the dial. The lunette, set with 40 diamonds, plus the white strap, accent the femininity of this piece, with the final flourish seen in a diamond-topped crown. The sapphire display back showcases the charming flower-shaped oscillating weight, and the beating heart of this timepiece, the calibre 2650RL.